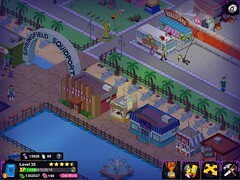 June was an exciting time for the game, as it introduced the Springfield Squidport as well as the ability to build all the way out to the sea. Prior to this update you could see the water, but you couldn’t expand your town out to the shoreline. Of course the focus wasn’t so much the land and water expansion, but the ability to build a boardwalk on the water. Once you got to Level 15 you could start your working on this new expansion, though it does divert some attention (and significant funds) away from expanding Springfield. It is probably best to avoid getting too wrapped up in the Squidport quests, especially if you’re struggling for cash. It’s more important to work on expanding your Springfield first. This thirty-two part quest line will require quite the bit of time, money, and patience as you wait increasingly longer for boardwalk tiles to be constructed. This walkthrough should help you gauge whether or not you want to start working on this expansion, or perhaps you would just like to review the quest dialogue for laughs. Either way, enjoy this fairly lengthy walkthrough. Even if you don’t have the funds to start placing buildings on the boardwalk, at least Three-Eyed Sushi is free, if you managed to earn it during the limited-time event to promote the twenty-fifth season premiere of The Simpsons. What have you done with your Three-Eyed Sushi? What have you done with the 三つ目寿司 building? Has it found a home on your boardwalk, or is space still a bit too cramped to think about adding expanding the seaside delicacy options? Ideally the quest to unlock this item should be completed before Tuesday, which consider how short it is, shouldn’t be a problem. If you’re having trouble getting this quest to trigger, remember that Homer initiates this set of quests. You’ll also need Lisa free, but not until the second part. Below are some Three-Eyed Sushi design placements by some other players; primarily the readers of this blog who asked to be added to my (now maxed out) friend list. Maybe your town has been featured, and if not maybe these designs will inspire you. Even if you haven’t started building the Squidport yet, don’t worry. This building will automatically be placed in your inventory when the quests are complete. So if you thought you had to rush through building Squidport just to get this limited-time building, take your time. Three-Eyed Sushi will be waiting to be placed once you’re ready.